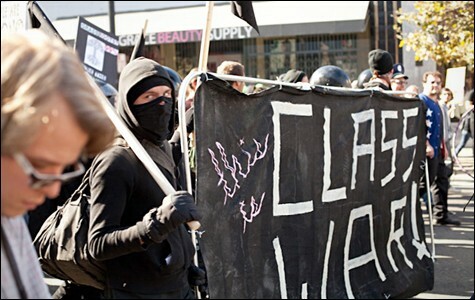 A "Black Bloc" tactic is to disguise oneself in black but not necessarily engage in violence. Freelance writer Marianne Moore contributed to this report. Since last week, the conventional wisdom among progressives has been that Occupy Oakland needs to condemn and expel the black-clad vandals who seek out violent clashes with police. The morning after last week's general strike turned into a night of chaos, many liberals showed up at Occupy Oakland urging demonstrators to embrace nonviolence, and some protesters responded in kind, by helping clean up debris and graffiti in downtown Oakland. But over the past week, the Occupy Oakland General Assembly has stopped short of denouncing violence, even though many occupiers have distanced themselves from what happened last Thursday morning. At times, calls for peace have been shouted down by the more militant members of the movement. In fact, since last week's events, there appears to be a contingent at Occupy Oakland that is openly embracing violent tactics. 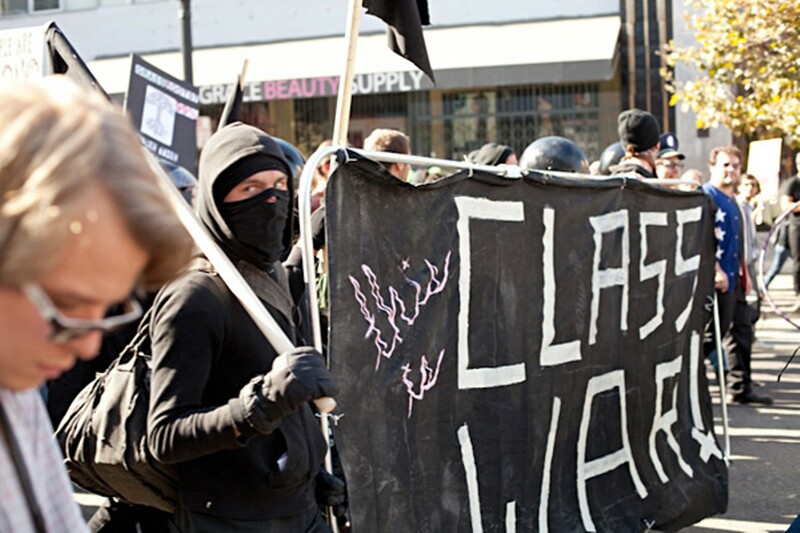 Oft called "The Black Bloc," or "the anarchist wing" of Occupy Oakland (even though many anarchists scorn them), the small group who turned last week's protest into chaos uses a methodology that gained currency after the 1999 World Trade Organization demonstrations in Seattle. They dress in black and obscure their faces with ski masks or bandanas, both to conceal individual identities, promote "solidarity" (i.e., the group looks like one autonomous bloc), and make it difficult for police to apprehend the protesters who throw rocks or light trash cans on fire. Not all Black Bloc protesters are violent; some merely wear the uniform as a fashion statement, or to show sympathy for their counterparts. One occupier said the black dress helped prevent mass arrests and persecution of individuals. He emphasized that Black Bloc protesters don't subscribe to any uniform political ideology — meaning that not all believe in violent revolution. 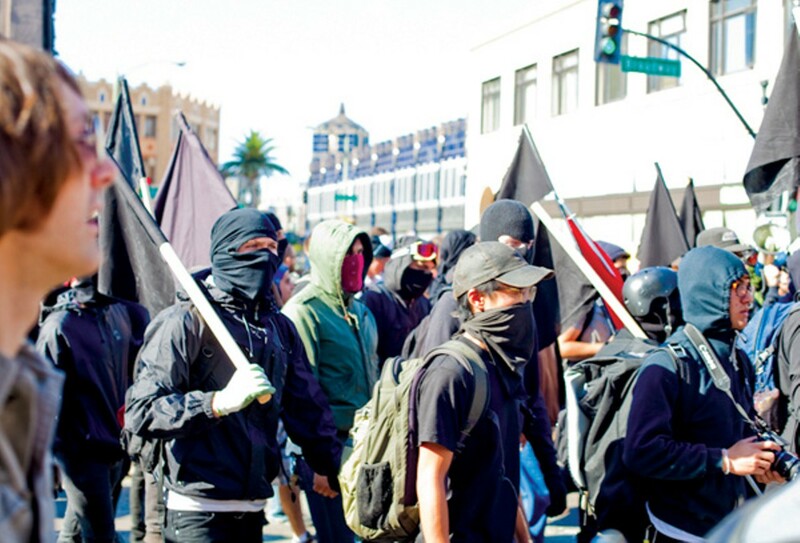 But prior to last week, the Black Bloc didn't seem to play a strong part in Occupy Oakland. When a group called the Oakland Liberation Front distributed "anti-peace brigade" fliers a couple days before the general strike, its members were largely denounced. When angry protesters advanced toward a line of cops during the October 29 march against police brutality, peaceful demonstrators intervened. In fact, the Black Bloc was a very small minority on the morning of the general strike. Wednesday's peaceful protest was dominated by union members and progressives who had not been camping out at City Hall. Members of the Service Employees International Union (SEIU) had marching orders to help direct traffic, diffuse conflicts, and keep the peace as large groups of people disrupted service at each of the big banks downtown. For the most part, the peace-keepers were successful. Even after a group of Black Bloc rogues broke off from the main protest to vandalize Whole Foods, the strike remained largely nonviolent. At 4 p.m., a giant group of strikers marched through West Oakland, en route to shut down the port. A couple people in front wheeled a life-size Gandhi float. People held signs that criticized bank bailouts and reframed the protest in economic terms. For a time, it looked as if the general strike would be wildly successful. But then as the evening wore on, the Black Bloc grabbed control. A group of thirty to fifty such protesters converged on an abandoned, foreclosed building that had formerly been home to a homeless services center. They broke in, and "occupied" the space. They handed out a prepared statement. It read: "The Oakland branch of the Traveler's Aid Society was a government-funded non-profit that provided aid to houseless people in our area. After the government cut funding to the program the Oakland branch faced foreclosure at the hands of their private lender." The protesters' plan? Reclaim the building. Turn it into a library and workshop center. "We are the 99 %," the statement ended. "This is our future." By itself, the takeover seemed to be in line with the Occupy Oakland's apparent new emphasis on direct action, rather than mere protest. More and more, protesters at Occupy Oakland have begun calling for appropriation and reclamation of space. Several speakers at the General Assembly meetings late last week called for "strategic occupations of empty buildings." Some argued that such "occupations" should occur by any means necessary, even if the occupiers had to build barricades, or light fires, or throw rocks at police in order to defend their territory. One woman who spoke at Thursday's meeting presented her view in stark, us-versus-the-system terms. "The amount of violence necessary to overthrow this monster is beyond what we currently have," she said. "So we have to be tactical, and outsmart those who outnumber us." It wasn't clear whether the protesters who took over Traveler's Aid intended violence. But shortly after midnight, when word came that police were headed over to shut down the protest, the demonstrators took action. They began building massive barricades at both the San Pablo and Telegraph intersections of 16th Street, using anything they could find — Dumpsters, recycle bins, pallets from the Occupied Oakland encampments, city-issued garbage cans. A black man who appeared to be there with his family (and who may or may not have been part of the occupation) attempted to take one of the barricades down. He said he lived in the neighborhood and that he, too, was part of the 99 percent, but he didn't approve of vandalism. A group of protesters surrounded him, yelling obscenities. Some accused him of being an agent provocateur. Vastly overwhelmed, the man finally left. One person observing the scene said it looked as though they'd been trained to intimidate intruders, or that it could have been "a mob mentality."